Jeff started a real estate career after spending 17 years as a communications professional with experience in journalism, corporate and government communications, marketing, and public relations. He’s had a life-long fascination with real estate and has experience buying run down properties and rehabbing them into modern homes. Jeff left the corporate world after providing strategic communications counsel for Altria, a tobacco and wine company. Prior to that, he was press secretary for Virginia Governor Bob McDonnell, capping off 13 years in Virginia state government that included serving as chief of communications with the Virginia Department of Transportation and director of public relations with the Virginia Department of Health. He began his career as a print reporter writing about the attractions and history of Central Virginia. 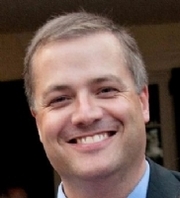 His extensive experience as a reporter, writer, and professional in state government has provided him a deep understanding of zoning, transportation, tax, and policy issues that impact real estate, and led him to explore the Commonwealth extensively from Bristol to Accomac and Virginia Beach to Winchester. He’s also passionate about spending time with his kids, finding unique antiques, restoring classic cars and woodworking. A native of upstate New York, he has lived in Chester for more than a decade and will love to help you find your next new home in the area.